Retirement plan accounts such as IRAs, qualified pension, or 401k Plans, all enable participants to grow money tax deferred. Yet distribution options, protection from creditors, beneficiary designations, and contribution limits can vary significantly by Plan type. The potential dollar loss due to protection differences and lost compounding of tax deferrals can be painfully significant. In this issue we will briefly outline the key issues for distribution options and creditor protection. Withdrawals from retirement plans follow similar rules, but there are some key differences. Unfortunately, it’s a common error for a 401k participant under the age of 59 ½ to believe they can take money from their account to pay for tuition or a home down payment without penalty and taxes. Often the confusion stems from misunderstanding a loan or hardship withdrawal option (if available) vs. a distribution. 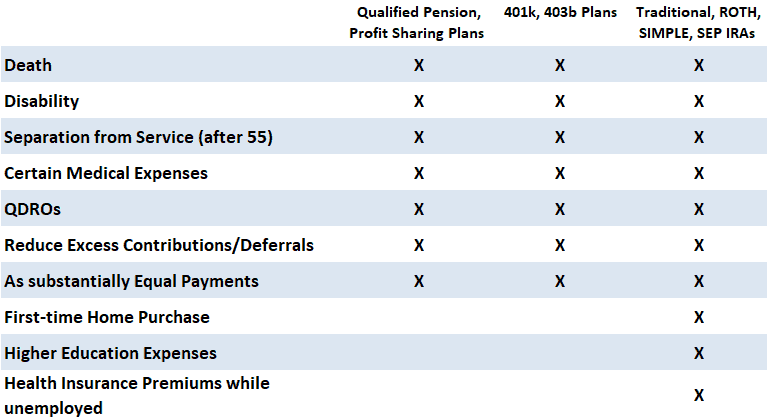 The table below is a general reference guide for understanding which distributions are exempt from the 10% penalty; however, before you act consult a financial and tax adviser to know if limits apply and how a distribution would apply to you (or your participants). To summarize the table below: the law likely affords your retirement plan more protection in bankruptcy than in cases where creditors try to win claim to your money. Even if it’s unlikely you’ll ever end up in bankruptcy court, understanding bankruptcy and creditor protection laws is another way to safeguard yourself from unforeseen events like a car accident or malpractice suit. Professions that face higher litigation risk (i.e. doctors, lawyers, contractors) should know that rolling over an ERISA plan into a non-ERISA plan such as an IRA, loses ERISA’s federal unlimited protection. You would then be subject to state laws which generally may not protect you as well. It would also be prudent to examine insurance coverage under umbrella and professional liability policies. Again, consult with your advisers if you aren’t clear. A lot could be at stake.